Basement waterproofing is important to protect your family's health and your belongings. Water damage affects almost 85% of all homes. Sealing out water from your home, with quality basement waterproofing products, will allow you to utilize every square inch of potential living space and keep your home structurally sound for years to come. Water entering a basement is a common problem for poured concrete basements, block basements, and especially rock basements. Sealing your basement will allow for an expanded living space or safe, dry storage. To learn what is causing your basement water problems and how to successfully repair your leaky basement, you must find a qualified sealed basement waterproofing contractor. Our national network of waterproofing experts can give you a free estimate for the very best system for your home. Basement waterproofing must be first broken down into two categories. First, there is sealed waterproofing from the outside the structure. This type of waterproofing (or basement sealing) collects surface and subsurface water and directs it away from the home. Often times this incorporates a coating that seals the foundation directly along with a French Drain tile system that lies next to the foundation. Next, there is “waterproofing” from inside the structure. This type of waterproofing should actually be called water management or water control. When using interior waterproofing you are actually collecting water that has entered your basement and sending it to a sealed sump pit system. Frequently, the waterproofing system that was installed when your home was built is of poor quality. The exterior spray is not waterproofing, it is a damproofing material. Combined with exterior drain systems that are not installed correctly and then they are routed to very poor performing sump pits or basins. This combination results in a recipe for wet basements and the need for foundation repair work. Luckily, with today’s technology and research, quality waterproofing contractors can solve these problems by replacing current ineffective systems with high-quality sealed systems designed to keep your home healthy and free from water for many years to come. Replacing poorly installed exterior drain tiles with new high performance sealed systems and directing them to sealed sump pits that house heavy duty sump pumps can help maintain a dry and healthy home for your family. Adding a sealed interior drainage system is often required to remove water that is beneath concrete floors causing cracks and flooded basements. When combined with crack sealing procedures or foundation repair work, water will stay outside of your home where it can be used by landscaping plants and trees. Open-backed or “open” interior basement systems can cause humidity and radon problems in many basements across the country. These systems sit on top of your basement footing and allow moisture and soil gases to enter living spaces causing health problems for many. 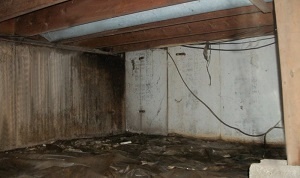 This is why “closed” or sealed waterproofing systems are the only choice for homeowners wanting to protect their home. Sealed interior drainage systems are a combination of a sealed sump pit and a sealed drain tile system that locks moisture and soil gases below the basement floor. During your free waterproofing estimate, your design professional will show you the advantages of a sealed basement waterproofing system. Our qualified basement waterproofing professionals can now provide special financing options upon providing your free in-home estimate. Let My Foundation Repairs match you with an Earth Contact Products contractor that can assist you with professional waterproofing systems and solutions.